Would you like this lesson on binomials in English as a PDF? Click here to get it. You know these types of phrases, right? They’re called binomials (or “binomial expressions” or “binomial pairs”). They make you sound more natural in English. You can express a lot with only 3 words, like with idioms. They can help you stop using the same phrases again and again. Today, you’re going to learn 29 of the most common binomials in English. By the way, there are so many binomials in English — how did I choose which ones to include? A lot of coursebooks and websites just list random binomials — many of them are old-fashioned and out of date. So I used an online corpus* to find the binomials that you’ll actually need — you know, the ones that people actually use in real life (not in a coursebook writer’s head). OK, not so relevant, but isn’t she lovely? So there are a lot more positive binomials in English than negative ones. There he is, safe and sound in his hammock. The inspectors have checked, and the building is safe and sound. We can move in tomorrow! After walking through the red-light district for hours, we finally got back to our hotel safe and sound. The family dog had been missing for 5 weeks when he was returned safe and sound to his owners. A neighbour had found him enjoying her swimming pool. Have you ever needed to escape to the countryside? To get away from the noise and chaos and stress of the big city? To just relax and enjoy the peace and quiet? OK. I’ve just researched the way this phrase is used, and I’ve found something interesting. So I guess this means that peace and quiet is something we often want, but don’t always get. If you’re a parent, you’ll know exactly what I’m talking about. Now that the accounts are done and dusted for the year, do you fancy a pint? And that’s it! The red team win the penalty shootout! They’ve won the championship! It’s all done and dusted! Now the football is finally over, and we can get on with our lives! I can specifically remember the first time I heard this phrase in context. It was my dad’s job to introduce the musicians. He went up on stage, said about 5 sentences, then sat down and then the musicians started the concert. This means “neat.” And “tidy.” Exactly what you’d expect! Can you deliver my doughnuts in a nice, neat-and-tidy package, please? Humphrey’s desk is always neat and tidy. Don’t touch anything — he’ll kill you. Yeah — he likes to keep the garden neat and tidy. He’s good at it, but I think he might need to get out a bit more. Some binomials are used to describe bad situations. That guy you see begging in the street. He’s got no money, no home. He’s not doing well at all. Well, he’s down and out. Tony? Don’t ask about Tony. He’s basically down and out these days. I’ve never seen so many down-and-out people in one place. I thought this was supposed to be a wealthy country. So you’ve bought some new clothes! They’re fresh, crisp and new. It feels great, doesn’t it? But what about those same clothes a year later? Although you take good care of them, they still fade, get a little broken and just don’t look as good. Well, that’s wear and tear. For sale: Giant, elephant-shaped, leather sofa. No signs of wear and tear. I love this book. I’ve read it about 7 times. Yes — it’s certainly showing a lot of wear and tear. This is when you’re in a situation where you feel helpless. You’re stuck in a situation you don’t want to be in, and it’s usually because you’re missing something that can get you out of that situation. You can’t pick me up? I’m in the middle of nowhere — there’s no bus for 7 hours. Don’t leave me high and dry like this! It was too late when I noticed that there was no toilet paper, leaving me high and dry. High and Dry is also a fantastic song. Some binomials don’t describe anything particularly good or bad — sometimes they just describe … things. It means the colours: black and white. That’s all! Back in the ’80s, we had a black-and-white TV. Daddy? Was the internet in black and white when you were a kid? But we can also use it to talk about how a situation isn’t so simple. You know those people who look at a complicated situation, and they think they can just describe it very simply? Like when they think that all librarians are evil people because they met a couple of bad librarians once. That’s when you can accuse them of black-and-white thinking. Come on! Don’t look at everything in black and white. The world’s a complicated place! I think we all know how to use this, right? I just wanted to include it because it’s a great example of a binomial in English we all use — even in other languages. Rock and roll is a genre that simply refuses to die! Sometimes in restaurants, they put the salt in the pepper pot and the pepper in the salt pot. I don’t know why they keep doing that. In exactly the kinds of ways you’d imagine using it. Pass the salt and pepper, would you? If you put salt and pepper on Brussels sprouts, they still taste horrible. If you were around in the ‘90s, you’ll remember these guys. There’s something very useful that binomials in English can do. They can talk about the good side and the bad side of something at the same time. So sometimes, they act as a sort of scale when you want to show balance. What would you say are the pros and cons of working as a lion tamer? This one’s a bit tricky. Basically, you have all these people who want to become successful performers. Now, the 3 minutes they get on stage (or however long they get) is possibly the most important 3 minutes they’ll have in their career, right? That’s because this performance will either “make” them (so they’ll be successful and rich and able to have as much cake as they like) or “break” them (they’ll look stupid in front of everyone and go back to working as a waiter. Or lion tamer. Or whatever they were doing before). It’s often used as a verb, and it’s commonly used to talk about love, money and careers. We can basically use this in any situation that involves good and bad experiences together. How was your holiday in Alaska? Well, we had our ups and downs. How’s it going with Andy? Well, we have our ups and downs. But we’re still going strong! It means that we learn from our mistakes. So making mistakes is fine. Because now we’ve learned something. I didn’t know you could take your own food and drink into this cinema! I’ve been buying their overpriced popcorn for years! Oh, well. Live and learn. OK. I mentioned his ex to him, and he went crazy. I won’t be doing that again. Live and learn. This one has a feeling of determination. You’ve got to get to your best friend’s wedding, and NOTHING is going to stop you! Or you’re going on your dream holiday camel riding through the Sahara (because you like weird holidays). Nothing will stop you — it’s your dream! I’m going to my best friend’s wedding, come rain or shine. I’ll be camel riding through the Sahara next week — come rain or shine. Dos and don’ts are basically rules. They’re usually not formal rules and are often not particularly strict. Unless someone asks you to write up a “dos and don’ts” list, then you probably won’t need to use this phrase much. But you will see them around in written English — usually as a sign somewhere public, like a swimming pool, a library, a hostel or a workplace kitchen — anywhere that might have informal rules. Label any food you put in the fridge. Leave old food in the fridge. Put wet spoons in the sugar. Use Humphrey’s mug — he’ll kill you. 5. Binomials in English for Amounts, Duration, Direction, Etc. These binomials describe how you do something, how something happens or how something is. They deal with the “hows”: how much, how big, how often, how soon, how carefully, etc. This means “mostly.” We can use it to describe anything that’s almost 100%. Anything that is measurable and not just black and white. He said he’d work hard this year and, by and large, he has. We need all the help we can get from the government but, by and large, they haven’t been helpful. How’s the new job? Well, by and large, it’s OK. Shame about all the paperwork. You can use this for anything that happens, then stops happening, then starts again, then stops again, and so on. You can say that you’ve been writing your first novel on and off recently. Or that they’ve been arguing on and off for most of their relationship. Or that he took all the money he earned from lion taming and lived in a hotel in Gibraltar on and off for about 10 years. Notice that we can put this after the verb or after the object. He’s been working for the circus on and off since he was a kid. They searched far and wide for the missing dog. In the end, they found him hiding in the garden. He travelled far and wide looking for the answer to the universe. He gave up and opened a café in Ipswich. People came from far and wide to see the pig-monkey. We can also talk about how things like rumours, information and discussion can spread far and wide. This phrase is usually used to talk about an instruction, a message or a signal. He’s letting us know, loud and clear, that he doesn’t want to go back in the cupboard. He’s given us a loud and clear signal — no more ice cream in the swimming pool. Well, he’s doing well — but sooner or later his luck’s going to run out. OK — that’s very impressive. But you’re going to have to let go sooner or later. This means “approximately” but doesn’t sound as scientific. You can use this in any of the situations that you’d use the word “about” (meaning “approximately”). There were more or less 300 people at the wedding. They must’ve spent a fortune! We were more or less a mile from the house when it started raining. He’s more or less a complete idiot. I have no idea how he won. There were about 200 people at the wedding, give or take. My YouTube channel’s exploded! I’ve got 10,000 subscribers, give or take. I had about 8 cups of tea last night — give or take 2. You can probably guess the meaning of this one. We watched his music writing get better and better, little by little. Little by little, he lost his enthusiasm for Sandra Bullock films. Especially the romantic comedies. Have you ever tried to construct something from Ikea? You try to follow the instructions step by step, but your cupboard still ends up looking like a broken chair. You should’ve read the step-by-step instructions more carefully. That’s why your cupboard looks like a chair. He plans to take over the world, step by step. He’s starting with Norway. The publisher put the book covers on back to front. My uncle can’t stand teenagers who wear their caps back to front. We can use this before or after SVO (usually after). He’s not a big drinker, but he enjoys a cocktail now and then. Football? No — I’m not a big fan. I might watch a match now and then, though. If it’s on. All in all, It was all right. But there were a few problems with the sharks. Yep — learning a language can be a challenge, but all in all, it’s a rewarding experience. So there we are — 29 common and useful binomials in English to make you sound more natural and express yourself better in English. Meanwhile, here’s a lovely song that includes some binomials. It’s by some band called Pink Floyd. I think they’re a bit famous. How often do you get to enjoy some peace and quiet? What’s the last thing that you had to throw away because of wear and tear? Do you know anyone who’s down and out? Have you ever been left high and dry? What happened? Is there anything that you’ve been doing on and off over the last year? Did you find this useful? Do you know any people (or seagulls) that might also benefit from this? Then BE AWESOME AND SHARE! Spread the knowledge! I guess a lot of people will find it extremally at Cambridge English exam, like FCE or CAE. Great resources. Done and Dusted is the only one we don’t use here in the colonies. It sounds Oh so British to me! Oh really? That kind of surprised me. It’s amazing how used to our own varieties of English we get. P.S. “The colonies!” Ha ha! Thank you Gabriel!!!!! Amazing explanations and even more amazing examples that captivate the reader’s attention and help them grasp the meaning of these fixed phrases!!!!!! Thanks a million!!!!! Dear teacher. If you don’t leave me high and dry I promise never give you cold shoulder. Especially in the winter! I wouldn’t risk anyone getting down and out! Is this post available for download in a printable Word or pdf version? It’s great stuff and I would like to print out a copy… And we know how online printing ends up. 31. That’s not covered even half of the ins and outs of the matter. You mind your P’s and Q’s, sir! 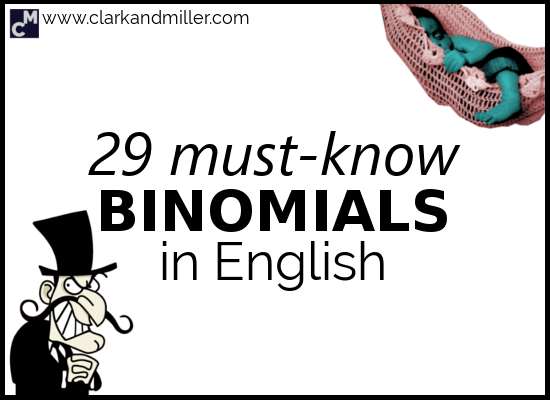 The title of your article is “29 Must-know Binomials,” but in the end, there were 27. What a cracking list Gabriel. I didn’t realise we used so many binomial expressions in day to day life. Speaking of which “day to day” – does that count as a binomial? You’ll have to do a post on trinomials next. The only one I can think of is “morning, noon and night”! That’ll get you started. Ever since I wrote this, I’ve found more and more (there’s another one) binomials that I hadn’t included. They’re all over the place! How about “lock, stock and barrel”? Thanks for this amazing web! What is the binomials of strong and….. Such a great blog about the most useful binomials in English. Everyone should learn from this knowledgable blog.